Find out how an unorthodox gym’s personalized fitness approach makes it a more effective weight training program and business. 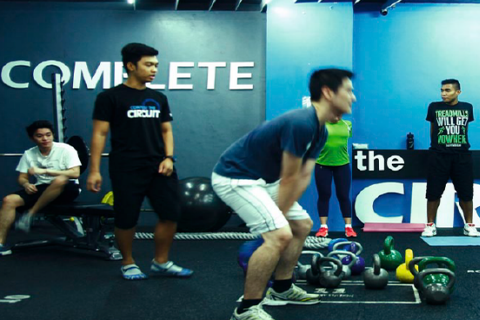 <>For the regular gym rat with a set workout, the layout of 360° Fitness Club in Ortigas, Pasig City may seem a bit odd. There’s no recessed lighting, an army of treadmills lining the wall, or a mosaic of flat screen TVs on display. With blank walls, rubberized floors, and an obvious lack of your typical gym machines, the fitness area is spartan and industrial. Instead, there are a few wooden boxes sitting in the middle of the floor, and a rack of medicine balls on the side. There’s a pull-up bar in the corner and a few light dumbbells lying around. And these, many swear, have helped them achieve the healthy lifestyle they’ve been looking for. To date, the club has 1,500 clients, 30 percent of whom are transferees from other gyms. It’s called circuit training: a combination of successive high-intensity aerobic exercises designed to give the body a pounding to help build endurance, strength, and encourage weight loss. Participants perform specific exercises in “stations” and move on to the next until the so-called circuit is done. It is this combination of a customized program packaged in a brisk half-hour interval that’s made it the fitness hub for those looking to get fit but are hoping to do it in the least amount of time possible. There are five difficulty levels determined by your current fitness level and your goal. A personal coach with a background in exercise science lends assistance in each session. You go up a level if it’s clear you’re ready. “It doesn’t just make more sense in programming, but it’s also more cost-efficient on the business side because we can easily update and upgrade equipment versus investing heavily in machines,” she adds.